I first started doing tie-dye six years ago, when my older daughter wanted a tie-dye theme for her sixth-birthday party. I did some reading, a friend pointed out the Dharma website, I got some supplies, I tried it out a couple of weeks in advance, it came out well, and I was hooked. Since then I've helped about a thousand people do tie-dye: more than 500 first graders, a couple of Girl Scout troops, several birthday and other parties, my class for middle schoolers, several kids' day camp and family camp sessions, three corporate team-building events, and lots of random sessions with friends. I love doing tie-dye as a hobby, but I'm actually more interested in teaching it to other people. I have no interest in doing it as a production-and-craft-fairs profession--Harmony can do a much better job, and I recognize their distinctive work on people all over town. I've mentioned before how I like to sneak in a little education when I teach people how to do tie-dye. Math, spatial skills, and so on. They get practice in colors and manual dexterity. And of course I think doing tie-dye is good for the soul, too. No, buying the mass-market tie-dye t-shirts at the local big-box store doesn't count. Origami (paper folding) and kirigami (paper cutting) are similar crafts that exercise those same mental and physical "muscles". I did lots of origami as a kid, and I loved it. I've also done some kirigami; those paper snowflakes I did in school were just the beginning. True, you don't end up with the same wearable results as with tie-dye (including shibori), but visualizing how the project is going to turn out is half the fun for all three crafts, as is the pleasure (for me) of folding materials precisely. Lately I've been playing with origami paper as a quick and concrete way to visualize how various folds might come out in tie-dye. The basic paper is cheap, thin, colorful, and easy to fold (I get 60 sheets for $1.50 USD at the local Daiso store). I've been folding it up in various wedges, squares, or rectangles, then piercing it in patterns using a push-pin into a small block of firm packaging foam. I particularly like the foam that feels a little soft and waxy (not Styrofoam/polystyrene), but anything you can easily push a pin into will work fine. I put the resulting pierced "snowflakes" up on a window so I can see the light pattern through them (dark paper colors work best), and they are very pretty. My kids joined in, of course, producing some beautiful ones of their own. My younger daughter folded her paper in random directions before piercing it, and she came out with some very intriguing designs. These paper creations were so easy, so fun, so cheap, and so clean (no cut-out pieces to sweep up!) that I added them to the activities roster for my younger daughter's ninth birthday party (a crafts theme, naturally) a couple weeks ago. It was a definite hit with most of the kids. For the goody bags (party favors), I sent home the foam blocks and push-pins the kids used, along with a fresh packet of origami paper for each child, in hope that they might do some more later and keep flexing those brains. Now I'm starting to work on translating a few of those paper designs into tie-dye. Sometimes I'm stitching the designs with dental floss, sometimes I'm just tying the designs without stitching. The more complex designs need to be stitched so they don't slip apart. I haven't dyed any of these yet, and they won't come out exactly like the paper patterns, but I'll post them when I do. In the meantime, try out some paper pattern piercing! Wow! I just discovered your site and went through every post. I would love to see how this shirt turned out. Thanks for all the inspiration! My kids and I tie dyed with our friends two days ago and I got curious tonight to look up some new ideas. Now I have a bunch of stuff to try. Hmmmmm...it's only midnight here in Vegas, maybe I'll hit the walmart for a pair of dark jeans, soft scrub with bleach and some stencils. LOL. Thanks, glad you like the blog! 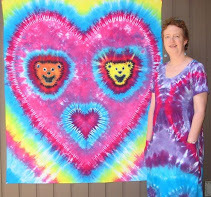 Be careful, tie-dye and discharge dyeing can be seriously addictive!